New Delhi, Dated: February 28, 2011 : The Union Budget 2011-12 aims to sustain economic growth, strengthen infrastructure, moderate the price rise, particularly of agricultural produce and reduce social imbalances through inclusive development. 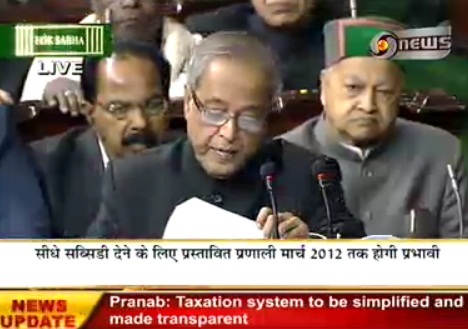 Presenting the budget 2011-12 in the Lok Sabha today, the Finance Minister Shri Pranab Mukherjee said that the budget is a transition towards a more transparent and result oriented economic management system in India. He said while developments on India’s external sector have been encouraging, continued high food prices have remained our principal concern. He said that the trend revealed shortcomings in distribution and marketing system. The Finance Minister said that huge differences between wholesale and retail prices are at the expense of remunerative prices for the farmers and competitive prices for consumers. For sustaining growth tax reform will continue with the Direct Taxes Code (DTC) to be operationalised from April, 2012 while a Constitution Amendment Bill is proposed to be introduced during the current session of Parliament as a step towards roll out of the Goods and Services Tax (GST). He said the introduction of DTC and GST will result in moderation of rates, simplification of laws and better compliance. The Finance Minister re-iterated the Government’s resolve to move towards direct transfer of cash subsidy to people living below poverty line in a phased manner. He said that the Nutrient Based Subsidy (NBS) has improved the availability of fertilizers and the Government is actively considering extension of NBS regime to cover urea. Finance Minister announced a number of measures to strengthen the agricultural sector particularly in the areas of pulses, vegetables and oil palm . He announced Rs. 300 crore expenditure to promote 60,000 pulses villages in rain fed areas for increasing crop productivity and strengthening market linkages. He also proposed to spend Rs. 300 crore to promote oil palm plantation in 60,000 hectares and Rs. 300 crore for the initiative on vegetable cluster. Rs. 400 crore is proposed to be spent to improve rice based cropping system in the Eastern Region. Capital investment in fertilizer production is proposed to be included as an infrastructure sub-sector since investment in the sector is capital intensive. The allocation for social sector has been increased by 17% to Rs. 1,60,887 crore which amounts to 36.4% of the total plan allocation. Bharat Nirman, which includes Pradhan Mantri Gram Sadak Yojana (PMGSY), accelerated irrigation benefit programme, Rajiv Gandhi Grameen Vidyutikaran Yojana, Indira Awas Yojana, National Rural Drinking Water Programme and Rural Telephony have together been allocated Rs. 58,000 crore. Remuneration for Anganwadi workers have been increased to Rs. 3000 per month from Rs. 1500 per month while the Anganwadi helpers will get Rs. 1500 per month. This will be effective from 1st April 2011 benefiting about 22 lakh Anganwadi workers and helpers. The allocation on education has been increased by 24% to Rs. 52,057 crore. Sarva Shiksha Abhiyan gets Rs. 21,000 crore which is 40% higher than the previous year’s allocation of Rs. 15,000 crore. The Finance Minister also proposed to introduce a scholarship scheme for needy students belonging to the Scheduled Castes and Scheduled Tribes studying in classes IX and X. It would benefit about 40 lakh students. Plan allocation for Health has also been increased by 20 per cent to Rs. 26,760 crores. The Rashtriya Swasthaya Bima Yojana will be extended to the unorganized sector workers in hazardous mining and associated industries. Underlining the need to strengthen Public Sector Banks (PSBs) the Finance Minister proposed to provide Rs. 6000 crore to maintain tier 1 capital to risk weighted asset ratio. He also proposed to infuse Rs. 500 crore into Regional Rural Banks (RRB) . A Women’s Self Help Groups Development Fund with a corpus of Rs. 500 crore is proposed to be created. He also proposed to create a micro finance equity fund of Rs. 100 crore with Small Industrial Development Bank of India (SIDBI) for providing equity to smaller micro finance institutions. Rs. 3000 crore will be provided to NABARD to help handloom weaver cooperative societies to become financially viable. Interest subvention of 1 per cent on housing loans will now be available for loans upto Rs. 15 lakh where the cost of house does not exceed Rs. 25 lakh. The present limit for the loan amount is Rs. 10 lakh while the cost of the house should not exceed Rs. 20 lakh. The total plan expenditure has been increased by 18.3 per cent to Rs. 4,41,547 crore and the non-plan expenditure increases by 10.9 per cent to Rs. 8,16,182 crore. The gross tax receipts are estimated to grow by 24.9 per cent to Rs. 9,32,440. Rs. 2,01,733 crore will be transferred to the Sates and UTs as plan and non plan transfers. This also marks a rise of 23 per cent over budget estimates of last year. The fiscal deficit is estimated at Rs. 4,12,817 crore which works out to 4.6 per cent of the GDP. Turning to the direct taxes, the Finance Minister proposed to increase the exemption limit for general category individual tax payers by Rs. 20,000 to Rs. 1,80,000 per year. This will provide a uniform tax relief of Rs. 2000 to every tax payer of this category. The benefit for senior citizens will now be available at 60 years of age and the exemption limit will go up from Rs. 2,40,000 to Rs. 2,50,000. Those who are 80 years and above have been brought under a new category called very senior citizens and the exemption limit in this category will be Rs. 5 lakhs. The minimum alternate tax rate has been hiked from 18 per cent to 18.5 per cent of book profits. Developers of Special Economic Zones as well as units operating MAT in SEZs have been brought under MAT. Tax benefit for investment in long term infrastructural bonds will continue for one more year. Income from foreign subsidiaries of Indian Company will now attract a lower tax of 15 per cent tax on dividends. Turning to indirect tax, the finance Minister said that there are 370 items that enjoy the exemption from Central Excise Duty but are chargeable to VAT. He proposed to withdraw the exemption on 130 of these items. The remaining 240 items would be brought into the tax net when GST is introduced. A nominal 1 per cent central excise duty is being imposed on 130 items. The basic customs duty has been reduced from 30 to 5 per cent on raw silk, from 5 to 2.5 per cent on certain textile intermediates and from 7.5 per cent to 5 per cent on certain inputs for manufacture of technical fibre and yarn. Stainless steel scrap has been fully exempted from customs. Export duty on iron ore has been increased to 20 per cent ad valorem both for lumps and fines. The basic customs duty on pet coke and gypsum has been reduced 2.5 per cent to give relief to cement industry. On the service tax front a few new services have been brought under tax net. Hotel accommodation in excess of Rs. 1000 per day and service provided by air conditioned restaurants with licence to serve liquor have been brought under the tax net. Service tax on air travel has been raised by Rs. 50 in case of domestic air travel and Rs. 250 on international journey by economy class. Services provided by Life Insurance Company in the area of investment and some more legal services have also been brought under tax net. Finance Minister said the proposals on direct taxes are estimated to result in a revenue loss of Rs. 11,500 crore while those on the service tax will yield Rs. 4000 crore more. The Finance Minister has kept the disinvestment target at Rs. 40,000 crore for the coming year. He, however, reiterated that the Government is committed to retain at least 51 percent ownership and management control of the CPSUs. He said that as an emerging economy India stands at the threshold at the decade which presents immense possibilities. He said we have the voice on the global stage and we must not let the recent trends and tensions hold us back from converting these possibilities into realities.